Cynthia Taggart, a poet, was a chronic invalid who attained a degree of celebrity for her writing, despite being bedridden for much of her life. 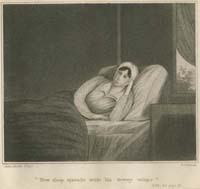 Until she died in 1849 she shared a home with her sister, who was also an invalid. Taggart’s portrait appears in a collection of her poems, published in her early thirties. Noticeably absent in the portrait is any indication of her career as a writer. Her ailing body takes precedence over her role as a writer in the frontispiece of the poetry collection. A brief biography accompanies a collection of her poems in Rufus Griswold’s The Female Poets of America (Philadelphia, 1849). The biography marvels at the apparently isolated capabilities of the body and the mind, referring to her intellectual competence as “a matter of astonishment” given “the ruins of the body.” Physical anguish is a recurring theme in her poetry, though the exact nature of her illness remains unclear.